Powder rooms make exceptional spaces for freshening up or serving as an extra restroom for guests like friends and family. With the holidays just around the corner, make your additional guests feel especially welcome by having a well-stocked and designed powder room to meet their needs. Our list provides important aspects to consider when planning the layout of a powder room. As with any room, a layered lighting effect will give the best results. The powder room serves as a place for guests to quickly freshen up and check how they look before rejoining festivities. The room should emanate a dramatic feel as a result of the lighting, and sophisticated features like a chandelier or vanity lamps can really enhance the feeling. Make it easy for guests to view themselves in the mirror by having layered lighting and multiple illumination sources so they can alter the lighting as they see fit. 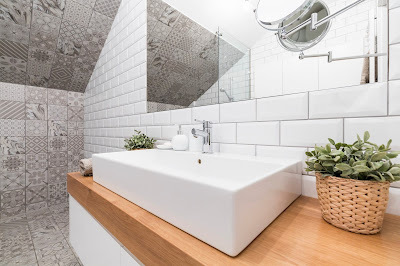 A well-stocked powder room can really make guests feel comfortable by letting them know that anything they might need is readily accessible and easy to find. Whether it’s extra toilet paper, towels or other toiletries, items like these can really serve to add an extra level of contentment for the guest. Apart from vanity storage, take advantage of any extra space your powder room may have by filling it with the necessities of a regular bathroom. 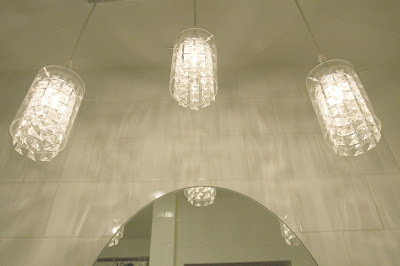 Choose a mirror that can be the central piece of the powder room and really pull everything together. The mirror is arguably the most important part of the room, so we recommend selecting a unique, beautifully crafted mirror for guests’ viewing pleasure. Make sure the mirror is large enough to capture effective light, making it easy for guests to see themselves. A supplemental vanity-top hand mirror can also add an extra spark of detail and practicality to the room by providing a magnified perspective. 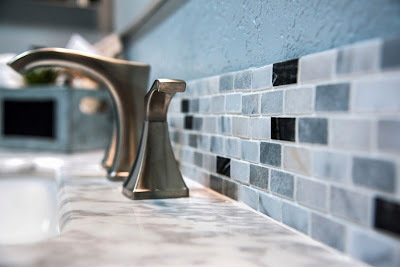 Your powder room countertop should accentuate the look and feel of the surrounding décor. Granite countertops are a popular choice as they are elegant-looking, reflect light well and are durable enough to withstand most minor impacts. Depending on the room design, you may want something a bit softer, such as a repurposed wood countertop, that gives a bit more of a cozy feeling. With this list of tips, you should be well on your way to creating the perfect powder room that will make your guests feel at home, and have everything they could possibly need. Have your own thoughts on how best to design a powder room? Add a comment, we love hearing from our readers!